A group of German construction workers start a tough job at a remote site in the Bulgarian countryside. The foreign land awakens the men’s sense of adventure. Likely called WESTERN because the characters in this Cannes hit travel to new frontiers like the classic John Ford and Howard Hawks westerns. 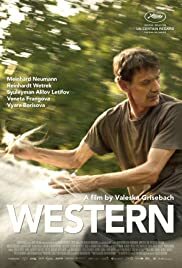 A group of German construction workers labouring in the Bulgarian countryside to earn more money but trouble arrives in unexpected ways. They raise their German flag proudly at the site. One of the workers tease the local girls swimming in the river. The locals take offence and old war resentment arises. The workers and the locals have a problem of communication because of language The film is a bit hard to follow as one wonders which language is actual spoken and who can communicate. Nothing much happens. Europeans particularly Germans would be able to appreciate this difficult diim more than North Americans. From inside Bolivia’s craziest prison a cocaine worker, a drug mule and his little sister reveal the countries relationship with cocaine. Shot in Bolivia — including inside the notorious San Sebastian prison — over five years, Violeta Ayala’s COCAINE PRISON takes a close look at two subjects – the cocaine trade and the conditions of the prison. What the audience sees is definitely shocking in this engaging film. The film follows Hernan and his sister Deisy, two Bolivian teenagers going to high school in Cochabamba with dreams of starting a band. Hernan gets caught and put to jail after attempting to carry two kilograms of cocaine across the border to Argentina. He is sent to San Sebastian prison, a scarcely staffed open-air facility where the prisoners make most of the rules. Prisons in Canada, in comparison look like a summer relax camp. In San Sebastian, inmates have to cough up US$2000 to buy a cell in the prison grounds or sleep outside with the risk off getting mugged. Director Ayala also follows the drug trade emphasizing the workers harvesting the leaves to the mules like Hernan who get imprisoned while the real drug dealers go free. There is a sort of happy ending for Hernan as he gets pardoned but things on the whole do not look good for anyone else, including Hernan after he is released. Director Ayala taught English in the prison, which gave her access to filming inside it. HAPPY END can be seen as a film that infuses many of the traits of Haneke’s previous films. When the film opens, the audience sees what is happening though the recording on a cell phone, the routine of a 12-year old (Fantine Harduin) similar to the video surveillance in Haneke’s film CACHE (HIDDEN). This 12-year old is not one to be tampered with. She has a mean streak, spying on her father’s (Matthieu Kassovitz) computer and discovering his affair. This is reminiscent of the power of children in Haneke’s THE WHITE RIBBON. The family is held together by Anne Laurent (Isabelle Huppert), the father’s sister. But suicide is in the mind of Anne’s father, Georges (Jean-Louis Trintignant). In Hanake’s first film, THE SEVENTH CONTINENT, the whole family committed mass suicide after a banquet meal. The dysfunctional family is all reminiscent of FUNNY GAMES in which a family is disrupted by a home invasion. All the events are seen from the point of view of the 12-year old, which brings the film to a good focus. The ending is just as funny and shows that life goes on, happy or not. What constitutes a HAPPY END, is the question Haneke poses. The same might be said for this exhaustive documentary, courtesy of director Sam Pollard, notable for having worked with Spike Lee. Davis’ talent and gift are so immense, that his presence takes over the entire movie. The doc does not contain a whole list of interviewees but just the most important ones – all being comedians including the recently deceased Jerry Lewis, Whoopi Goldberg and Billy Crystal. All pay tribute to the legendary, multi-talented song-and-dance man, in this exhilarating documentary which is part of the American Masters series. Davis is shown here as dancer, singer (including a full rendering of the songs ‘I’ve Got to be Me’ and ‘Mr. Bojangles’), impressionist, and actor of unparalleled charisma. He broke racial barriers (including marrying a white wife) but paid a heavy price for it. Pollard’s documentary of the legend ends up both an insightful and entertaining piece. I am sure many like me, could watch Sammy Davis, Jr. for hours. From the director of THE TREE OF LIFE, this film has Malick at his most personal, which might not be a film for everyone. Many segments will only make sense to Malick. The film is reported to be a years-in-the-making ode to the wonder of creation. The wildly ambitious Voyage of Time: Life’s Journey, according to Malick, leads the audience on a temporal trip through the history of the universe. The film begins with light and darkness and explosions interpreted to be the birth of stars and the evolution of life on Earth. The film is then set in the inky depths of the oceans, where incandescent creatures float in the darkness. The poetic narration written by Malick is voiced by Cate Blanchett. But not all the segments are original. Some like the funnel of thousands of small fish devoured by other bigger fish and diving birds have been shown on Disnyeworld films. Also warning: the soundtrack is crisp clear. Anyone eating popcorn can be heard. I had to tell the person behind me to stop eating!